What is the MEALS Program? Hot nutritious noon meals are served weekdays in communities throughout western South Dakota. Participants may enjoy a meal with their friends and neighbors at our 29 group dining sites, located in 16 communities in the region. In addition, friendly volunteers deliver meals to people who are homebound and unable to prepare a meal themselves. 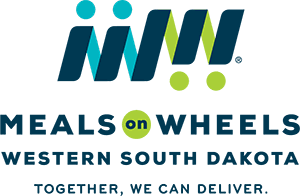 This is a service of Western South Dakota Senior Services, Inc., a private, non-profit organization whose purpose is to promote the well-being of senior citizens through nutritious meals, nutrition education, socialization and other supportive services. The program is supported through the Federal Older Americans Act, participant donations, the State of South Dakota and local fund raising efforts. U.S. Department of Agriculture resources are also used. Anyone 60 years of age or older is welcome to come. If the spouse of an eligible participant is under 60, he or she may participate as well. As we age, we tend to need fewer calories - but not fewer nutrients. It is essential that we make wise food choices and eat nutritionally balanced meals every day. Good nutrition can help keep us healthier and out of hospitals and nursing homes. Well-nourished seniors generally have shorter hospital stays, lower health care costs, faster healing, fewer health complications and lower mortality rates. Good nutritional habits are also instrumental to recovery when illness or injury affects our health. While the menu is different each day, we do follow specific menu guidelines that are diabetic friendly. Each meal contains one-third of the Recommended Daily Allowance, which is one serving of protein, three servings of vegetables or fruit, one serving of bread, milk and a dessert. Modified texture diets are available for persons with chewing or swallowing problems. What does the MEALS Program Cost? Meals are available on a donation basis accoording to suggested income guidelines. Those under 60 are asked to pay the full cost of the meal. Food stamps and EBT cards are accepted. No eligible participant will be denied a meal based on inability to pay.